We bid another farewell to someone from the business known as show this week. Jimmy Perry has popped his clogs aged just 93. Who, you ask. Jimmy Perry, the creator of Dad’s Army. Success came fairly late to Mr Perry. He was 45 before Dad’s Army, his first sitcom, was first broadcast. The situation revolved around his own memories of wartime service in the Home Guard; the Dad’s Army of the title. His next big success was similarly based on his own memories; It Ain’t Half Hot Mum was based on his wartime experiences in Burma with the Royal Artillery. His third big success, Hi-De-Hi, once again used his own recollections; on this occasion, his time spent as a ‘Redcoat’ at Butlins. Although, the later two were hugely popular, his earliest creation, Dad’s Army is perhaps remembered with the most fondness. Why is this? It had a lot to do with it dealing with a subject that much of the British population of the time (it was first broadcast only 23 years after the war ended) had experienced. Hi-De-Hi did cover an experience familiar to many people, but not one that everybody could recognise. It Ain’t Half Hot Mum, for all its success, was really only about the experiences of Jimmy Perry and others who found themselves stationed in an army barracks in a faraway land. Of course, it has been said of situation comedies that ‘situation’ is irrelevant. Porridge? Set in a jail. MASH? Set in a field hospital in a warzone. [Mash? Porridge? Has this turned into a food blog? - Ed.] As long as a sitcom is well-written and has memorable acting, the situation doesn’t matter. In that case, why is Dad’s Army still being repeated on the Beeb Beeb Ceeb to this day, 39 years after the last ever episode first aired, while It Ain’t Half Hot Mum and Hi-De-Hi haven’t been seen for donkey’s years? Is it because it recalled a time that so many people could relate to? My own explanation is more prosaic (That’s a good word; must look it up.). Dad’s Army was Jimmy Perry’s first comedy success. Perhaps, when he was writing it, he thought it might be his only success. I reckon that Jimmy Perry put all his best characters, stories and lines into that programme and those that followed just couldn’t match it. To me, It Ain’t Half Hot Mum was not especially funny. The characters, generally, were fairly unmemorable. Think of all the characters from Dad’s Army - from Pike’s immaturity, to Jones’ over-excitedness, to Mainwaring’s pomposity - each had enough ‘foibles’ to make him memorable. Can you even name anyone from It Ain’t Half Hot? Lofty? Does that count? I have to admit, I barely gave Hi-De-Hi a chance. After watching the first couple of episodes, I didn’t tune in again. I found the gags to be a bit laboured and the characters not particularly memorable, or likeable, for that matter. My view was that Perry’s best work was over; nothing even came close to Dad’s Army. Obviously, I was in the minority, because It Ain’t Half Hot Mum ran for seven years; Hi-De-Hi ran for eight. After those two bit the dust, Perry dreamed up another sitcom called You Rang M’Lord. It took a few actors from Hi-De-Hi and a few from It Ain’t Half Hot Mum and put them all into another situation; though all were, basically, reprising the roles they had played in the originals. The expression ‘flogging a dead horse’ comes to mind. Are you showing any interest in the EFL Cup (or League Cup in old money)? If you answered ‘not much’, you are probably still giving it more attention than the managers of the teams that are taking part in the competition. On Tuesday night a team named Liverpool beat a team called Tottenham Hotspur. I put it that way because neither was a team that had ever played in a serious game before. Klopp put out a Liverpool side that had eleven... yes eleven... changes from the team that had played in the previous Saturday’s game against West Brom. A completely different team! Spurs’ manager Pochettino wasn’t much better; he changed ten in the starting eleven from the previous game. The fans are still having to shell out £20 to see them. That may seem a low price to see two Premiershit sides squaring up to each other, but they weren’t watching Premiershit sides, were they? They were watching two second-string teams. Why is the cup even in existence if the top teams just aren’t interested? It wasn’t just Liverpool and Spurs making mass changes to the starting line-ups (although they were the worst offenders); there were ten Premiershit teams taking part in the EFL Cup this week and there were, in all, 70 changes to team line-ups. It isn’t fair on the supporters and it isn’t fair on the teams from the lower divisions. Basically, it is a rip-off. I can recall a situation many years ago [Uh oh. Hovis time - Ed.] when my own favoured team, Motherwell took on ex-Rangers goalkeeper Andy Goram. He was a big money signing as far as Motherwell were concerned and, although his best years were behind him, he was still a pretty good goalie. Certainly, he was considered to be better than Stevie Woods who barely got a game after Goram was signed... that is until the first time Motherwell played Celtic when Goram and Woods swapped places. Why did this happen? Well, Goram had once been the keeper for Rangers for many years and, as you may well be aware, Rangers fans are not too keen on Celtic and Celtic fans are less than ecstatic about Rangers. Celtic fans were certainly not fans of Mr Goram; he had made it quite clear during his spell at Rangers that the feeling was mutual. Football fans have long memories. This was the main consideration when Billy Davies, the Motherwell manager, dropped Goram from the first team for the meeting with Celtic. He knew perfectly well that Goram would be heckled, booed and worse from the start to the end of the game so, to avoid any trouble, the safest option was to simply not play him. Why am I telling you this? When the team was announced for the game, the radio pundits and presenters in Scotland had a field day. The main complaint was that football managers had a duty to the club and the fans to field the strongest team they possibly could. As the Motherwell manager was not doing this, there should be a punishment. The suggestions for a fit punishment included deducting points from the club, fining the manager, fining the club and even ejection from the SPL. The feeling on the matter was so high that it was discussed for hours before the game and for weeks afterwards. That was caused by one substitution Messrs Klopp and Pochettino. If you had tried substituting a whole team in Scotland, I hate to think what punishment the Scottish media-men would have suggested for you. It’s a long time since anyone has been hanged, drawn and quartered. Scott Arfield's 90th-minute winner gave Burnley their third win of the season in a match dominated by Everton at Turf Moor. It had looked like Yannick Bolasie's first Everton goal had earned his side a point before Arfield fired home after Johann Berg Gudmundsson's fierce shot rebounded off the crossbar. Kevin Mirallas nearly gave the visitors an early lead but an error by Everton keeper Maarten Stekelenburg allowed Sam Vokes to poke Burnley in front. Bolasie stole the ball off team-mate Romelu Lukaku before firing across home keeper Tom Heaton to equalise. Lukaku was twice close to making it 2-1 to the Toffees but Michael Keane and Heaton both made crucial clearances with the Belgium striker ready to pounce. Leicester stretched their unbeaten home run to 20 league games as the Foxes followed up their midweek Champions League win with victory over Crystal Palace. Summer signing Ahmed Musa scored his first goal for the club, while Shinji Okazaki and Christian Fuchs struck after the break - the latter's effort a superb volley - to secure a convincing win. Yohan Cabaye scored a consolation for the Londoners. Adam Armstrong put the Tykes ahead as Conor Hourihane's free-kick was nodded down by Marley Watkins and fired in. Scott Hogan had a fine chance to level as he got in behind the visitors' defence, but Adam Davies was quick off his line to deny the Brentford forward his ninth goal of the season. The win was sealed when Ryan Kent hit the post and Sam Winnall pounced. Iain Davidson gave Raith the lead with a close range strike but within 60 seconds John Baird took advantage of poor defending to equalise. Mark Stewart headed in another for Raith then set up Declan McManus to make it 3-1. Substitute Lee Miller pulled one back with another header, but two minutes later Stewart netted Rovers fourth. They’ll be dancing in the streets of Raith! Aye well, onward and upward. I wonder if The Grambler can improve on that this week. Hmm... think I may have said that before. Any road up, what has he/she/it come up with this week? Teaser time. Yay! Last week I asked you which two brothers played in the same match at both the 2010 and 2014 World Cup Finals, but played for opposing sides. The answer was Kevin-Prince Boateng playing for Ghana and Jerome Boateng who played for Germany. One for this week? In the 2008-9 season which goalkeeper set a world league clean sheet record by not conceding a goal for 1311 minutes? That’s over 14 games without letting a goal in, incidentally. A good one to ask down the pub. And finally, Cyril? And finally Esther, I am indebted to a Mr J. Perry who, as you already know, created Dad’s Army. 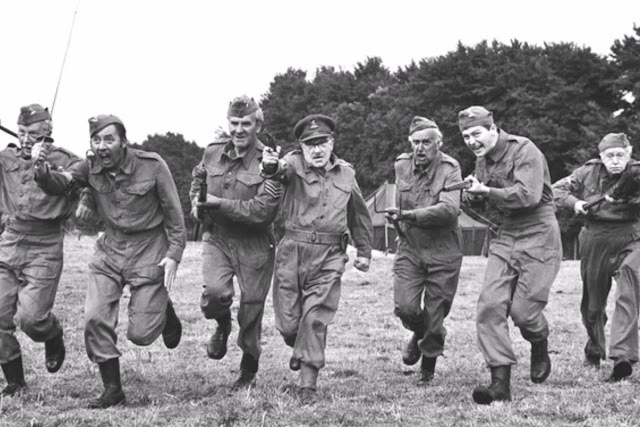 Did you also know that one tiny section of one episode of Dad’s Army was voted by the british public (who presumably were bothered) as the single funniest moment ever in any television situation comedy? That is quite an accolade, when you consider some other great moments... What about Basil Fawlty hitting his car with a tree branch? Del Boy falling through the bar? The Two Ronnies’ four candles sketch? No. They all lagged behind this moment from Dad's Army.